Entrepreneurship and The Maverick Innovation Center | Colorado Mesa Univ. 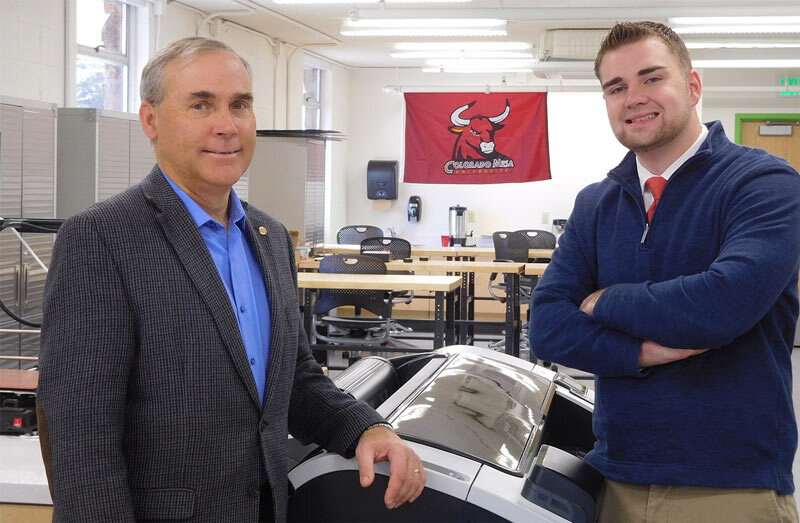 Student Aden Cesmat developed his patent pending idea in the Maverick Innovation Center with guidance from the center's director, Tom Benton. Human progress starts with innovation – new ways to see, think, solve. Colorado Mesa University takes the lead in this endeavor by bringing together the thinkers, researchers and doers behind tomorrow’s new ideas. We believe the most exciting innovations are derived from cross-disciplinary collaboration, an entrepreneurial faculty and a strong partnership with the greater community. That is why we have created structured programs that teach the skills of being an entrepreneur while encouraging exploration with faculty mentors and connecting students with industry leaders. A Maverick is an unorthodox or independent-minded person - a person curious about the world, a person that connects people and ideas to solve problems. At CMU, the Maverick is more than our mascot. Our commitment to CMU Mavericks is to bring together the people and resources to support your ideas to change the world.